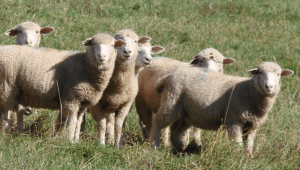 The Common Pastures program is implemented by the Browse and Grass Growers Cooperative. The volunteers for Economic Growth Alliance (VEGA) Farmer-to-Farmer Special Program Support Project funded by the U.S. Agency for International Development (USAID) provided initial support. Common Pastures’ mission is to help farmers and their families create sustainable small ruminant production processes to help enhance their quality of life and provide a predictable source of income, through information and technical training. Program beneficiaries are smallholder, low-resource, cooperative members, and their families, including youth, single and widowed women, farmers with disabilities, and students attending agricultural secondary and postsecondary schools. Hosts are smallholder, low-resource farmer cooperatives and agro-pastoral institutes in the Koulikoro, Sikasso, and Ségou regions of Mali, West Africa. The problem: In Mali, there is a high demand for livestock and meat. Livestock products are among the top 10 agricultural commodities produced in Mali and account for approximately half of Mali’s agricultural GDP. Small ruminants are especially important in rural Mali as 80 percent of the population own sheep and/or goats and depend on their contribution to family income and food security. They are a socially acceptable business for women, with low initial investment, minimal labor demand, and easy market access. 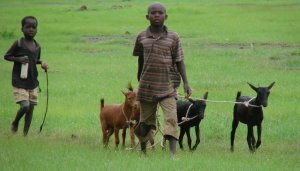 Youth and young children safely interact and share in the daily care of sheep and goats, keeping both out of trouble for much of the daylight hours outside of school. And yet, livestock inventories over the last 20 years have not been increasing in productivity and are far behind the productivity rates in other developing countries. The demand for animal products in Mali is only partially being met, while the demand for meat is predicted to grow steadily in coming decades (FAO, 2014). The productivity of Malian herds will need to improve dramatically to prevent the gap between demand and supply from increasing further. For information on all our Mali projects and activities visit the Common Pastures website. Spirit of Humane is committed to technical information and education on humane handling and slaughter systems for small scale operations. In recent years, consumers around the world have become concerned with animal welfare, both on the farm and at the time of slaughter. Small farmers who raise pastured animals in small family groups prefer to complete the process in animal friendly, safe facilities. The lack of appropriate slaughter facilities, especially for the smaller ruminants such as goats and sheep, nationwide is very apparent. With partial funding from a Sustainable Agriculture Research and Education (SARE) grant we were able to work with Joe Regenstein, Ph.D. and with oversight provided by Temple Grandin, Ph.D. Dr Regenstein is an international consultant of food production and a professor of Food Science, at Cornell University. Dr. Grandin is a designer of livestock handling facilities and a Professor of Animal Science at Colorado State University in Fort Collins, Colorado and a well-known advocate for humane treatment of livestock. Humane slaughter involves more than a quick, painless death for the animal. Except in rare situations, an instant death for the animal is seldom the issue. Whether the animal is transported from the farm, a commercial feed lot, or even walked to the slaughter facility, as is the case in many countries, the transition has begun from production to processing. At this point, whether the ownership of the animal changes or not, the producer usually gives up control of the process to the trucker, facility handlers and the slaughter workers. If this transition is not handled with high expectations for calm, quality care and processing, the highest producer’s production standards will be undermined. Find information at the Spirit of Humane website.